Home » Posts tagged "Proftlich&Schmidlin"
Some other Value-Investors think that the problems of Delticom are only short-term issues: EBIT-Margins will bounce back to their old highs. Delticom has a really light business model: everything is outsourced to third party distributors. No use of purchase power: Delticom uses a fixed premium on the purchase price of every tire, sometimes it uses a flexible mark up to account for seasonality and inventory management. No customer captivity due to long purchase cycles of over 4 years. No lock-in of fitting shops. What do we mean with too high ROCE and ROIC, and why is the biggest advantage of Delticom also its weakest spot? 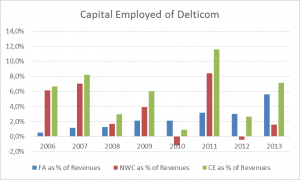 Many other investors think that Delticom is able to return to its old EBIT-Margins, but we don’t think so. Why? The answer lies in the Business Model of Delticom which is extremely asset-light. 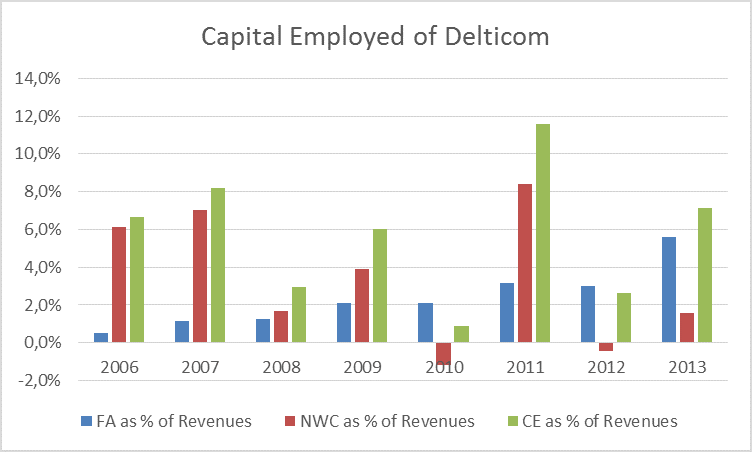 As you can see in the chart below, the Capital Employed of Delticom is 7,1 % of 2013 Revenues, relatively low in comparison to other companies, but for Delticom itself higher than in the year of 2006 (6,6%) and virtually sky-rocketed from its low in the year of 2010 (0,9%) where Delticom also has shown its highest EBIT margin (11,1%). The combination of high EBIT-Margins and low Capital Employed lead to an astonishing high ROCE of 276% in the year of 2010. Furthermore the ROCE was still high (51%) in 2013 where Delticom only had a EBIT-Margin of 3,6% and a Capital Employed of 7,1% of revenue. This high ROCE’s is also the reason why this business is so attractive for every competitor, if you cannot defend your turf with a big moat. As we don’t think that Delticom has a moat, we think that every time the EBIT-margins are high enough new competitor will enter the game. So let’s come to our valuation of Delticom. We have explained already that we don’t think Delticom has a moat and is a pure execution business only, so we use a discount rate of 10%. If we discount our Earning Power Value, assume an EBIT-Margin of 4% in the future and subtract the debt of Delticom we end up with a fair value of 16,62 EUR per share. This is not far away from our current trading price of around 17,5 EUR and is in our opinion quiet low for an evaluation without any future growth. Delticom was able to growth its revenues by 17,7% p.a. over the last five years. If we now assume a growth of 8,8% in average over the next 5 years (10% in 2015 declining to 7% in 2018) which we think is quiet conservative, we end up with an N-EPV of 28 EUR per Share in the year of 2018 or an IRR of 13,7%. (Capital allocation is assumed to be stable: 43% dividends, 3% growth CAPEX, 2% change in NWC and no share repurchases.) If you than use the Growth Multiple of Greenwald to calculate the Terminal Value with a 3% growth rate, you end up with an N-EPV of 37,92 EUR per Share at the end of the year of 2018. Which is equal to an IRR of 20,1%.